The Counter Assault Backpacker / Cross Draw Neoprene Bear Spray Holster is designed for use with any style backpack or hydration pack so you can always keep your bear spray close by. Strap the Counter Assault Bear bell to your backpack, clothing or trekking pole before heading out into the wilderness. Its loud jingle alerts bears and other animals to your presence. Avoid an unpleasant surprise and alert animals to your presence as you hike when you wear the Counter Assault Bear Bell with magnetic silencer. Counter Assault Bear Deterrent Spray - 10.2 fl. oz. With a high-volume, atomized blast of concentrated spray to deter a bear attack, the 10.2 fl. oz. Counter Assault Bear Deterrent pepper spray offers an optimal combination of spray time and distance. Counter Assault Bear Deterrent Spray - 8.1 fl. oz. Offering an optimal combination of spray time and distance, the Counter Assault Bear Deterrent pepper spray deploys a high-volume, atomized blast of concentrated spray to deter a bear attack. This durable nylon holster keeps your canister of Counter Assault Bear Deterrent spray (sold separately) secure and within easy reach while you travel in bear country. Combining 8.1 and 10.2 fl.oz. 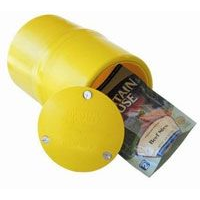 canisters with holsters, the Counter Assault Bear Deterrent Spray Magnum Value Pack deploys powerful blasts of concentrated pepper spray to deter bear attacks. Deploy powerful blasts of concentrated pepper spray to deter bear attacks with the Counter Assault Bear Deterrent Pepper Spray Value Pack. It offers two 8.1 fl. oz. canisters with convenient holsters. Counter Assault Bear Protection Bear Keg BK914. Provides 716 cubic inches of storage. Weighs 3.5 lbs.